For quantitative determination of creatinine and evaluation of drug effects on creatinine metabolism. 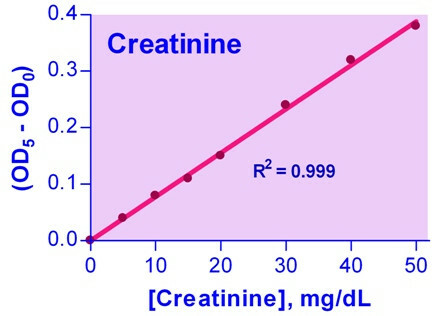 Creatinine is synthesized in the body at a fairly constant rate from creatine, which is produced during muscle contractions from creatine phosphate. In the blood, creatinine is removed by filtration through the glomeruli of the kidney and is secreted into urine. In healthy individuals, creatinine secretion is independent of diet and is fairly constant. The creatinine clearance test has become one of the most sensitive tests for measuring glomerular filtration rate. In kidney disease, creatinine levels in the blood are elevated, whereas the creatinine clearance rate and hence the urine levels are diminished. Creatinine test is most widely used to assess kidney function. Simple, direct and automation-ready procedures for measuring creatinine concentration in biological samples are becoming popular in Research and Drug Discovery. BioAssay Systems’ creatinine assay kit is designed to measure creatinine directly in biological samples without any pretreatment. The improved Jaffe method utilizes picrate that forms a red colored complex with creatinine. The intensity of the color, measured at 510nm, is directly proportional to creatinine concentration in the sample. The optimized formulation substantially reduces interference by substances in the raw sample. Applications For quantitative determination of creatinine and evaluation of drug effects on creatinine metabolism. 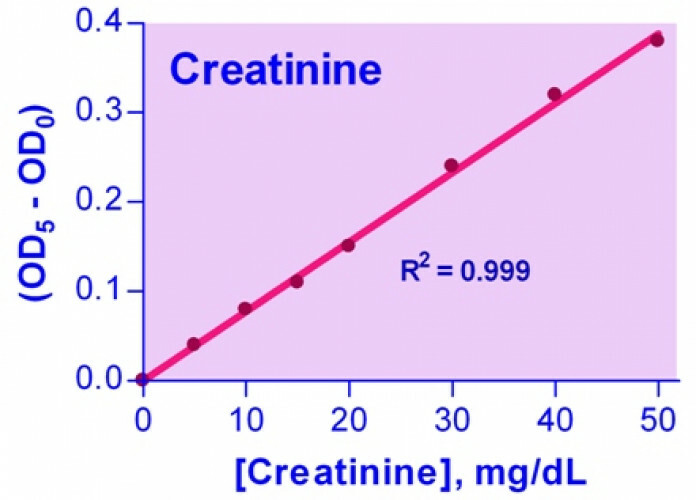 References Assay: Creatinine in Mouse Serum (Pubmed).